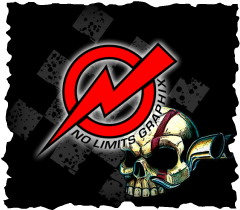 No Limits Graphix is family owned and operated business, specializing in working with small and start up business. We have an in-house graphic designer and offer services including - but not limited to - sign and banner design and printing, screen printing, commercial vehicle lettering, custom apparel and accessories, seamstress services, and much much more! No job is too small and all orders are treated with the same priority. Picture graphic design as a creative process — most often involving a client and a designer and usually completed in conjunction with producers of form (i.e., printers, programmers, signmakers, etc.) — undertaken in order to convey a specific message (or messages) to a targeted audience. Graphic design often refers to both the process (designing) by which the communication is created and the products (designs) which are generated. Common uses of graphic design include identity (logos and branding), websites, advertisements and product packaging. For example, a product package might include a logo or other artwork, organized text and pure design elements such as shapes and color which unify the piece. Composition is one of the most important features of graphic design, especially when using pre-existing materials or diverse elements. Design can also aid in selling a products or idea through effective visual communication. It is applied to products and elements of company identity like logos, colors, packaging, and text. Small business owners need to maximize their advertising budgets. One of the most effective ways to do so is vehicle branding, which will pay for itself in the form of new clients. 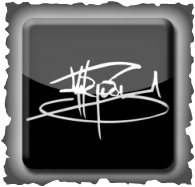 You are welcome to provide your own art or design, or we are happy to do the design work for you. Store front windows, yard signs, magnetic signs, banners, full color digital printing: we will fulfill your needs big or small. Have an idea in your head? We can make it a reality! We specialize in custom work of all kinds, from custom decals tolettering tents and hard hats. Don't be afraid to ask, there are endless possibilities! Full Service screen printing - shirts, sweatshirts, hats and more - at competitive prices. Need a small amount of shirts, we can do quantities of 1-30 without the need to screen print and pay screen charges, perfect for small and start up business. Also offering custom can koozies, as well as many other customized accessories. Need seat cushions re-upholstered? Our in house seamstress specializes in it whether it is an RV, chairs or anything else with fabric! Please call and speak to Susan for any of your seamstress needs! Micheal T. Figueroa - aka Figtastic - is a very talented tattoo artist who tattoos at Don's Downtown Ink, 78 S. Broadway in downtown Aurora. Please visit www.facebook.com/figtastic & preview some of Mike's outstanding work. 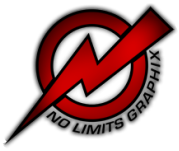 Visit www.NoLimitsGraphix.com and Tell Them The Graffiti of War Project Sent You! Support The US Economy by Supporting Small Businesses!